Excellent tool for all DCC users. Plug in a new decoder before installation to verify all of its functions before use. 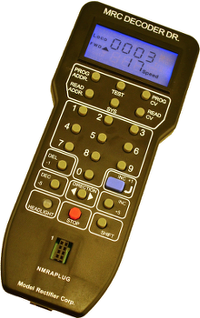 Easily perform programming and decoder read back functions. Program, read back, or test decoders by using a section of track or by plugging a decoder into the 8 pin NMRA socket enclosed on the Decoder Dr.
all 28 functions including bells, horns, etc. Works with all NMRA compliant decoders & locomotives in Z, N, HO, O, and G scales.